On January 2nd Saudi Arabia executed 47 people on charges of "terrorism" in what was a plainly unfair trial. Among them was a prominent and very outspoken Shia cleric Ayatollah Nimr Al-Nimr. Ayatollah Nimr became prominent for his role in the 2011 Shia protests in Saudi Arabia in the wake of the Arab spring. The specific charges he was convicted for included "disobeying the ruler", "inciting sectarian strife", "encouraging, leading & participating in protests". In order words he was liquidated through state sponsored murder for peacefully exercising his right to freedom of speech. Aside from him and 3 other Shia youth activists, all others executed were convicted of being involved with Al-Qaeda including Adel al-Dhubaiti, who shot and paralyzed Frank Gardner of the BBC in 2004 and Faris Al-Zahrani Al Qaeda's top religious authority in Saudi Arabia. Seeing as Nimr did not have access to prepare his defence and did not have a lawyer to represent him, it is very difficult to take the Saudi "justice" system seriously. These unjust executions have brought about widespread condemnations from human rights groups to Ayatollah Sistani to UN Secretary General Ban Ki Moon and has inspired many protests around the world. However, there does seem to be some confusion in regards to the man himself, with anti-Shia bigots and Saudi government apologists throwing charges of "terrorism", "Iranian agent" and "extremist" at him. So I will try to make clear some of the controversies surrounding Nimr. This is the easiest one to answer. Eventhough the Saudi state have tried to paint Nimr as a terrorist and he was convicted in the Specialized Criminal Court (SCC). A court dedicated to counter-terrorism. 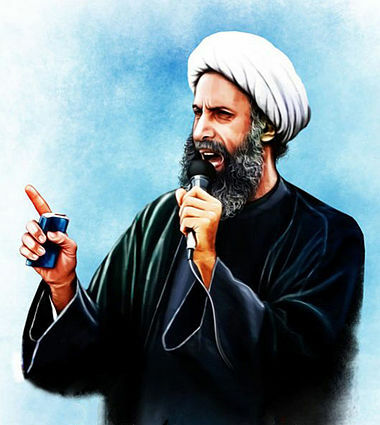 As far as we know Nimr had no connections to any terrorist cell or organisation and has not engaged in any violent activities directed toward the Saudi government or Saudi civilians. So the question of terrorism is pretty much void. Is he an Iranian shill? It is true that Iran has piggybacked on Nimr's struggles in Saudi Arabia and will co-opt his death to achieve political capital, both to deflect from its own human rights violations against Iranian citizens and its participation in the destruction of Syria, supporting and facilitating sectarianism in the Middle East. Iran wants to portray itself as the guardian of the rights of the global Shia muslim community. What better way acheive this than showing solidarity with the Saudi Shia community and their most vocal leader who are oppressed by the Wahhabi state. However it is incorrect to assume he is simply an Iranian puppet because he is on record as criticising the Assad wishing for its downfall. A murderous regime which the Iranians are supporting to the tilt. Nimr was not a sectarian agitator either. He called for Sunnis and Shias to unite against oppressors regardless of sects. Not something a mere Iranian puppet would say. Is he a "Liberal reformer"? The other controversy is his views on politics and religion. Some people will assume he is a Vilyat e-Faqih ideologue. While it is true he was once a follower of Grand Ayatollah Mohammad Hussaini Shirazi who was an influential Islamist theorist sympathetic to the Islamic revolution in Iran. He devised the Hukumat al-Fuqaha' principle of theocratic rule which is very similar to Khomeini's Vilyat e-Faqih (Guardianship of the single jurist). Where they differ is one who gets to rule. Khomeini believed in the rule of a single jurist while Shirazi prefered a council of jurists to rule in governance. Nimr moved away from Shirazi and followed his nephew Grand Ayatollah Al-Modarresi another well known Shia Islamist. 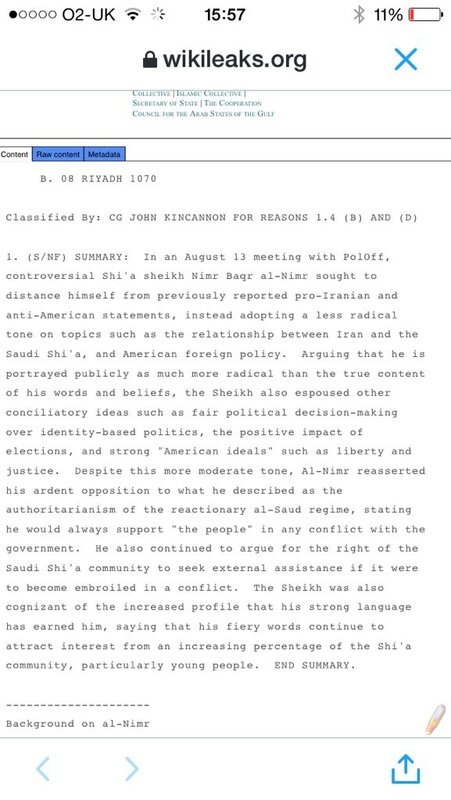 According to this wikileaks (of all people) cable Ayatollah Nimr favored "something between" individual and council forms of guardianship of the Islamic Jurists as a form of government. So it is clear that he supported theocratic governance of some kind. This piece of information is often ignored by many people. Despite this, his statements seem to be moderate and reform minded focused on defending the rights of a long oppressed and discriminated Shia muslim minority of Saudi Arabia. He was primarily concerned with the lack of political and economic rights Shia muslims had within Saudi Arabia which made him popular amongst the Shia proletariat and the youth. 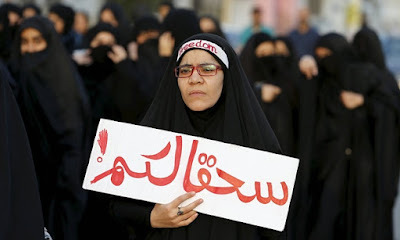 Criticism from Nimr was also strong towards the Saudi supported Sunni monarchy of Bahrain for its own human rights violations towads the majority Shia muslim community there. This very interesting Wikileaks cable gives you more of an insight into the views of Al-Nimr. In it he criticises identity politics, spoke highly of elections and believed American ideals of liberty and justice were compatible with Shia Islam. In summary, his key demands were "end sectarian discrimination, release of political prisoners, greater representation of Shias and economic development. Make no mistake about this, whatever your view of Ayatollah Nimr his execution is a grave crime without excuse or justification. Not only because of the lack of a fair judicial process but it further demonstrates to dissidents that non-violent politics and peaceful resistance to oppression will not work as it will just get you killed. Shutting down any dissent by just killing people for holding opinions you dont like will inevitably lead others into more extreme politics as they dont have a peaceful avenue to express their grievances. There is no doubt the Ayatollah's execution will increase sectarian tensions not just in Saudi Arabia but in the Middle East generally. We've already seen protests in Iran, Saudi Arabia, Pakistan, Iraq and Bahrain by Shias angry at this crime. The Saudi embassy in Tehran was stormed by protestors and its consulate in Masfahan was torched by rioters which was a stupid move as it allowed the Saudis to play the victim. In Saudi Arabia's eastern province young Shia protesters violently attacked police forces . In Iraq two Sunni mosques have been attacked. Saudi Arabia has also cut ties with Iran, with Bahrain, Sudan and UAE following suit with statements of moral support from Egypt and Somalia. Therby raising the temperature in an already smouldering Middle East. It seems the Saudis carried out these executions in order to firstly reassure the world that it is serious about fighting Sunni militancy hence the reason why most of those executed were convicted of being Al-Qaeda members. Let us not forget the Saudis fear an internal Salafist rebellion as much as Shia agitation. All the past threats to Al-Sauds rule from a 1920s tribal rebellion to riots in the 1960s, a siege at Mecca's Grand Mosque in 1979 and protests after the Gulf War in the 1990s, were caused by ultra-conservative Sunni anger at modernization or ties with the West. Secondly, to prove to the Wahhabi hardliners particularly those potentially sympathetic to Jihadism that they will not buckle to Shia agitation. The Saudi regimes's legitimacy depends on their enourmous financial wealth and on being the sectarian Wahhabi "defender of the faith". Raising the sectarian bar by provoking a Shia reaction only helps the Saudis to rally the Wahhabi clerics and their followers to their side. Thirdly, to send a message to the general public that dissent or criticism of any kind towards the kingdom or the status quo will not be tolerated and will be punished severeley. What will happen next? I don't know but one thing is certain. This is just making official what has been unofficial since the Islamic Revolution in Iran. Iran and Saudi Arabia are at war. Sadly, the people of Yemen, Syria and Iraq will be the ones that will pay for this foolish escalation and cynical divide and rule sectarianism with their blood. Nimr's execution is forcing Sunnis and Shias to pick a camp, Saudi Arabia or Iran. Just like the "ISIS or Assad" false choice in Syria. The moral and sane choice is to reject both.